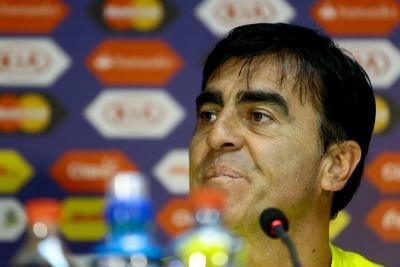 Quito, Aug 22 (IANS) Ecuador coach Gustavo Quinteros has urged his team’s lesser known players to assume greater responsibility as the South American outfit attempts to secure a berth in next year’s FIFA World Cup. Quinteros was forced to leave out a raft of high-profile names for his side’s World Cup qualifiers against Brazil and Peru due to injuries, reports Xinhua news agency. Among those missing from his 27-man squad which was announced on Monday were Arturo Mina, Frickson Erazo, Alexander Dominguez, Jefferson Montero and Miller Bolanos. “The most important players for us right now are those in the squad,” Argentine-born Quinteros said on Monday. Ecuador will face Brazil in Porto Alegre on August 31 before hosting Peru in Lima five days later. Quinteros’ side are currently sixth in the 10-team South American group qualifying standings with four matches remaining. The top four teams will earn an automatic spot in football showpiece tournament in Russia while the fifth-ranked side will book an intercontinental play-off berth. Goalkeepers: Esteban Dreer (Emelec), Maximo Banguera (Barcelona de Guayaquil), Librado Azcona (Olimpia). Defenders: Pedro Velasco, Luis Caicedo and Dario Aimar (Barcelona de Guayaquil), Robert Arboleda (Sao Paulo), Gabriel Achilier (Morelia, Mexico), Fernando Leon (Independiente del Valle), Cristian Ramirez (Krasnodar, Rusia), Walter Ayovi (Guayaquil City) and Oscar Bagui (Emelec). Midfielders: Antonio Valencia (Manchester United), Renato Ibarra (America), Cristhian Noboa (Zenit), Pedro Quinonez and Fernando Gaibor (Emelec), Carlos Gruezo (Dallas FC), Matias Oyola and Marcos Caicedo (Barcelona de Guayaquil), Angel Mena (Cruz Azul), Juan Cazares (Atletico Mineiro) and Jefferson Orejuela (Fluminense). Forwards: Enner Valencia (Tigres), Felipe Caicedo (Lazio), Michael Estrada (Independiente del Valle) and Fidel Martinez (Atlas).